Storage is a necessary pain. What do we want from storage? Easy to find the parts. Easy to setup and maintain. Some people want to see the part. Here we are mostly concerned with small parts which can be a problem no matter how much space you have. These are small ( but available in a variety of sizes ) brown paper envelops. You can buy them in boxes of hundreds. What is good about them. Little wasted space for small parts. Easy to write on ( and erase and reuse ). Very inexpensive ( 500 for $15 recently on Amazon ). Need to store them but see pictures for one way. Unclear on static issues, but can be used with static foam or bags. Parts are not physically protected. Coin Envolopes in a drawer. Fair amount of wasted space. Drawer takes up same space empty or full. Nice labels are a bit of a pain. Can be expensive, and almost never cheap. Parts fairly visible by opening the drawer. 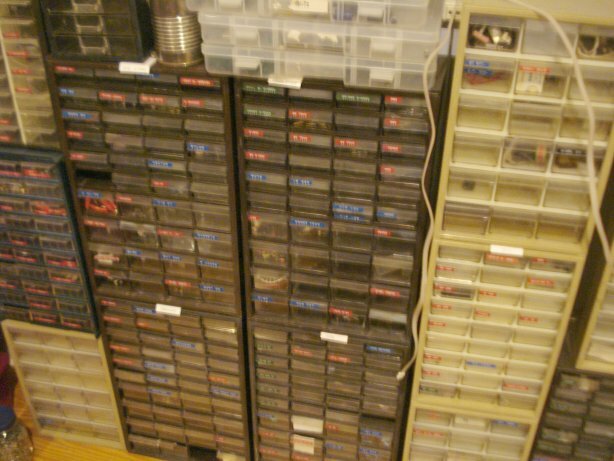 Plastic boxes with divided sections. A significant disadvantage is that you can not easily dump just one kind of part to root through them. There are some inserts for notebooks with envelopes or pockets. Some are clear so you can see the parts. We could use some more info on this. Best for moderate sized parts when static is not an issue and seeing the part is. Reused washed food bags and they are free. Need a larger container to store them. Many are made that are easy to stack in a stable way. For larger parts. Can get ( with a good deal ) for about $1.00. May be used to hold smaller containers like baggies or coin envelopes. 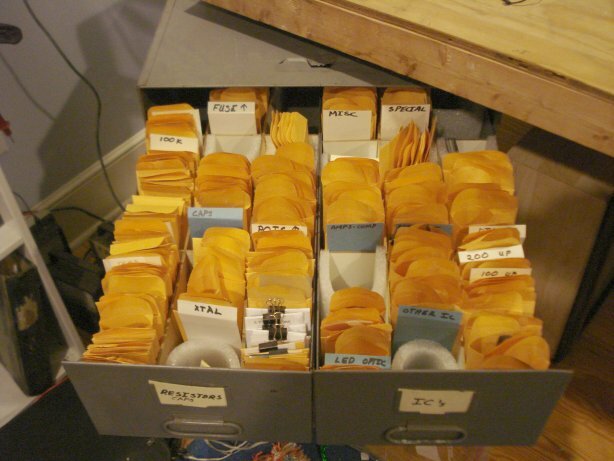 Ultimate Parts Storage The notebook method. 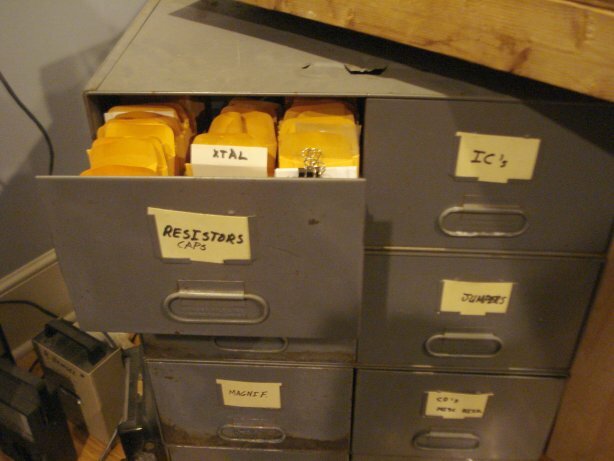 What's the best way to store and categorise resistors/capacitors/ICs/etc? This page was last modified on 28 December 2011, at 10:38.